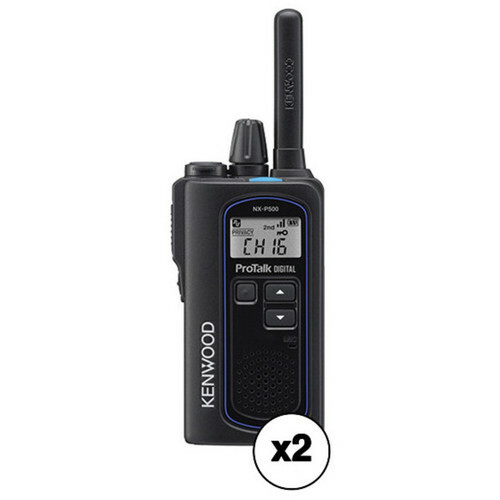 This B&H Kit includes two Kenwood ProTalk Digital NX-P500 6-Channel UHF 2-Way Business Radios, each with a battery pack and charger, an AC adapter, and a belt clip holster. With six UHF band channels, dual-mode NXDN digital and FM analog functionality, 219 privacy codes, and built-in signal processing via equalization, companding, and noise suppression, this kit is ideal for secure, reliable, and convenient communication between workers in a variety of indoor and outdoor environments. The compact Kenwood ProTalk Digital NX-P500 is a 6-channel UHF 2-way business radio designed to provide quick communication between employees. It offers dual-mode NXDN digital and FM analog functionality plus an equalizer, noise suppressor, and compander for enhanced intelligibility. This push-to-talk radio has a user-switchable power output from one to two watts, and features controls for easy adjustment of volume, channels, and more. The channel scan function scans all channels for incoming transmissions, allowing you to keep track of all six channels. The radio also features 219 privacy codes which can be set for each channel to provide an uninterrupted transmission between employees. FleetSync technology helps identify which user is speaking by displaying the radio ID on the built-in backlit LCD screen. Built for durability, this radio complies with MIL-STD regulations (810C, 810D, 810E, 810F, and 810G) and boasts IP54, IP55, and IP67 ratings for environmental resistance. The supplied battery pack powers the NX-P500 for up to 15.5 hours and is easily recharged via the included charger and AC adapter. Box Dimensions (LxWxH) 9.35 x 9.05 x 3.25"